I had an issue were I started to publish reports via Crystal Reports Server 2008, but if I included the variable SI_VIEWER_URL so that a link to the report would be included, it always went to wrong host name, and not to the DNS Alias that I setup. Also, It kept referring to the “JAVA” openDocument viewer, and I am using the .NET version. Thats all there is. Now Next time you include the SI_VIEWER_URL variable, it should point to the URL you entered in the CMC Settings Above. Recently someone asked me how to reset the Administrator password on a Crystal Reports Servers 2008 installation without losing all the data. I’m going to share here the solution, just in case someone else is searching for the same thing. In the Crystal Database, there is a table called “InfoObjects6”, maybe you have already heard of it in one of my previous post. 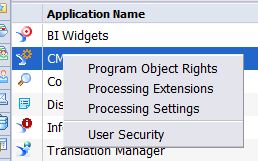 In this table, the object with objectID = 12 is the Administrator account. For those whom are curious what this really does. The CRC is the “hash” that verifies that the value of the “Properties” column has not been changed. By setting it to blank, it makes whatever password is stored under Properties Invalid. Next time you try to log in, a new “default” password hash will be created along with a new CRC. Basically, it will set the Administrator password to blank, at which point you can log in and set it to whatever you want!! Every time I get a new toy, like any techie I have to see whats under the hood. And this time it was the Javelin S4 Media Server NAS by Patriot. I bought this NAS to help solve my storage needs. I’m into photography, and currently I have 4 different External HD’s to store my photos. Problem is, they all get out of sync with each other, and there was no real easy way to maintain them all. My solution was to get a NAS that would support RAID and thus, thanks to a nice rebate from newegg I got the Javelin S4. The *ONLY* problem I had found was that the S4 didn’t support SSH (like it was listed on Newegg.com’s website), and I wanted/needed to be able to SFTP/SSH. I had 2 problems to overcome. First, gain access to the console on the NAS, second, add SSH to the device. BadIntentions was kind enough to release a plugin called “Rooter” which allowed “root” access to the console via telnet port 2380, and also it included a new, enhanced version of busybox that he compiled for the device. Once I was in, I started to look around the NAS and found that getting SSH on this thing wasn’t going to be easy. Most of the files in /etc are replaced every time the device gets rebooted, and the partition of the OS where all the utility scripts reside is set to read-only. So I went about searching for a way to get SSH on this thing, and through my poking around the system I realized that the only way I was going to get SSH was going to be by creating a “plugin”. 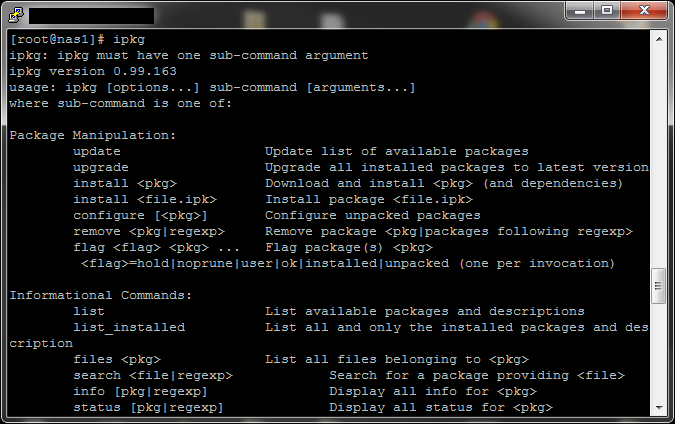 so I wasn’t worried about ssh running, the only issue was, were to get it from. I automatically thought about the optware project. These guys have been around for a while, and knowing the work that they have done with the NSLU2, and other NAS devices, I figured it was only a matter of finding the right “feed” (this is what they call the package repositories) that would work on the S4. Through some searching, I found that the Synology DS101G has a “similar” PowerPC processor, so I took the risk of giving the packages from the ds101g a try. Created all the necessary folders and symlinks, placed all the binaries where they were expected, ran the ssh command, and voila, I now had SSH, and I was done (but not quite). Now I could have called it a day, maybe try to create a plugin for SSH on the S4, but I though, why not get the whole IPKG system working on the S4. Really contribute to the community, plus with optware running on the S4, It would open up this device to way more binaries besides SSH, and make this a very powerful box. So I went about taking apart the Optware Install Script for the DS101G also known as the DS101Bootstrap. Since there are two versions of the DS101, we specifically target the DS101*G* which has a powerpc processor. The only thing left now if for me to package all this up into a nice .ppg that the S4 will recognize and automatically install via the webpanel. The day you want to get rid of optware, its as easy as deleting the plugin from the web panel as well. In my case, I had to re-add the “User Profile Service Application”. I found an article online by Amit Khanna Tittle “Associating services to Custom Application Proxy Groups in Sharepoint 2010”, which explained how to create a new group and associate a service, so I figured that would help me. It’s obviously an error with the Name or “Identity” of the ProxyGroup, and the command Get-SPServiceApplicationProxyGroup gives you the “friendly” name of the service, but not the real name. In order to get the real name you need to run this command “Get-SPServiceApplicationProxyGroup | Select Name,Id” Interestingly enough, you can see that the real name is “<blank>”. It seems that in Sharepoint 2010 it is common for the Site Web Analytics reports and Site Collection Web Analytics reports to not show data. Many Folks over at the MS TechNet Forum seemed to think that it was an issue with Sharepoint, but it is really not. The real issue is that the Jobs that are supposed to collect the data for the Health Analyzer are disabled by default. So you must go in and enable them. 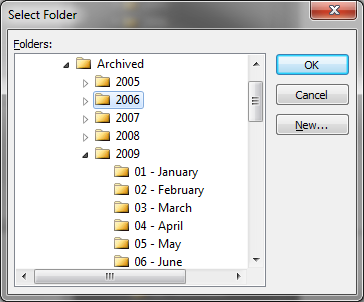 Where is the Startup Folder For All Users In Windows 2008? I needed to make bginfo, a great utility from our friends over at Microsoft (SysInternals) run for every user that logged in to a set of servers I had built. My solution needed to be simple. Add a shortcut to the “All users” startup folder, but I couldn’t find it. Turns out that it got moved and its hidden. There it is. Simple. Shortcut Created. Done. 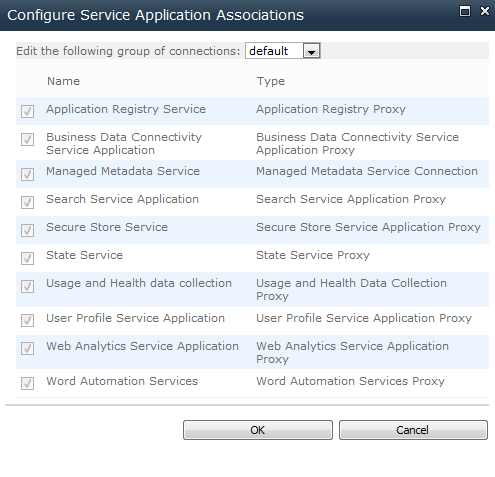 Had an issue, when after authenticating to the NetScaler, and then hitting the Email tab, The OWA login page came up. 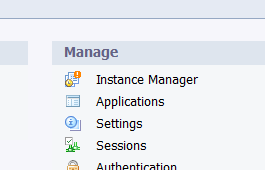 Even though OWA worked fine internally, and an Internal version of the Access Gateway worked fine too. To Fix it, I switched from using SAMAccountName (me) to UserPrincipalName (theusername@thedomain.com) in my “LDAP Authentication Server”, that way the domain was included with the login token, and passed on to OWA. That was it, now OWA works internally and extenally!! Had a very annoying issue when trying to add my exchange email address to my freshly re-installed/downgrade of Outlook 2010 to Outlook 2003 instance. Fortunate for me, the guys over at bayareapchelper.com the solution to my exact problem. Delete Mapisvc.inf. When it comes to exchange, I hate when my mailbox becomes slow. This is something that I’m sure we all deal with. Microsoft recommends that you keep 5000 items or less. I got tired of manually organizing my Inbox, so what I did was create a VBA Macro for Outlook, that goes through a folder you select and sorts items out by month. Once its done, the organize form will disappear, and if you go look at your folders, they will be organized from January to December (look at screen shot #3) and the corresponding messages moved to them. MsgBox "You must pick a valid folder to organize"
That’s the entire Organize Script. You can use this code as is, or modify it to fit your own needs.